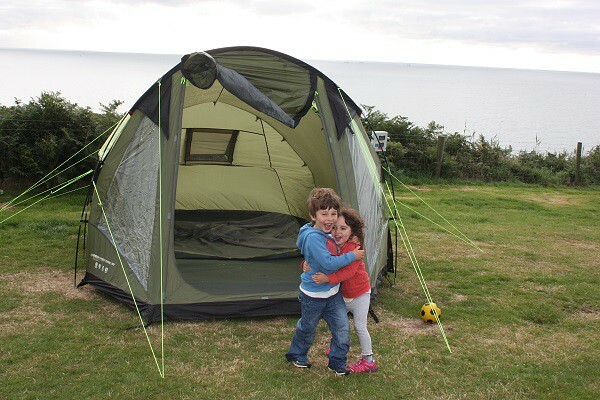 If you are looking for a cool family experience close to Dublin, you should go camping on the silver strand, a stretch of sandy beach in Co. Wicklow, on the east coast of Ireland. We first started thinking of camping there two months ago, at the beginning of the summer. Philip was the champion of this family trip: his idea was that a tent and some basic camping gear were the best ingredients for family fun and he showed remarkable consistency in trying to convince me to go. In principle, I was never against camping but in practice, I had some reservations. We went camping last summer, in Canada, and while we are very fond of that experience, there is one thing we all remember well: it was freezing! So cold even Philip had to admit we should have prepared better: this is unusual, as traditionally my complaints about the weather are put down to my ‘picky Italian standards’. Learning from experience, we decided that we would hold off camping in Ireland until we could count on a dry, sunny and reasonably warm day. Such a day arrived in late August and so we headed off camping on the silver strand. How to get there: car (necessary). The drive to the Silver strand won’t take long from the city and there is plenty of space for the cars inside the camp grounds. Facilities: Wolohans Silver strand camping and caravan park has a small shop onsite where you can get first necessities and camping gear. Additional shops and restaurants are within a short distance from the campsite but a car is needed as Wicklow town is about 3 miles away and the road does not allow for pedestrians. The campsite is open to tents and motor caravans and occupies over 22 acres, covered by soft grass. There are no playground or play facilities as such in the camping, but the sandy beach is easily accessible by kids (although not by buggies) so all you need is buckets and spades to be sure of a good day out! The silver strand is less than one hour south of Dublin, so a very easy drive for us. The beach is sheltered by cliffs and is accessible through Wolohans’ caravan and camping park: we spent the night at the camping, but the beach is also accessible to non-guests: just ask at the shop at the entrance and you will be directed to designated parking space. When you first arrive at the camping, what opens in front of you is a wide lawn, stretching all the way to the cliffs: you can only guess the presence of the beach, from here, but the view is promising. What you cannot guess is that this gently sloping lawn doesn’t slope as gently once you get close to the water! The beach is significantly lower than the lawn and this makes for a beautiful, wild scenery once on its soft sands. The camping is clean, well kept and has the facilities you would expect: toilets, laundry room, showers and a shop with camping supplies. The whole property is well maintained and has some nice touches, like flowers pots and whitewashed cottages, and the only slightly negative thing I can say about it is that it is not very atmospheric. The site is a big field, perfect for kids to run around and to perch a tent, but not exactly the evocative Irish woodland experience I had pictured. My fault entirely: I just had the wrong expectations about ‘camping in mystical Ireland’ – the place is functional, clean, well located and the view over the Irish sea beautiful. We perched our tent at the end of the field, where the ground was flat. Other tents were here and this made sense considering the geography of the place. Part of the field is on a slight slope: the flattest parts are either the top of the hill (flat but exposed to the wind) or beside the external fence, beach side. We chose this last option as the fence provided some shelter from the wind. Armed with duvets from home, an inflatable bed, yoga mats and biscuits, we made our home! The beach is sandy and subject to tide, so depending on the time of day you might find yourself in a small cove (live we did) or on a wider stretch. The beach has some small caves, eroded by wind and water: you can’t venture in (they are too small), but they make for great games. Who might live in the cave? We had a fun afternoon at the beach (the fact that we are wearing jumpers and sweaters might tell you that a warm Irish summer day is not that warm!) but the moment that was really special wasn’t then, but rather the following morning: I was the first one up and this is what I saw right outside our tent. Unlike the previous day, the morning was chilly and grey, but this made the beach feel really remote and magical: It was freezing, mystical and… silver! At that time the beach was almost entirely for us, only two other, older children around: you could hear the screams of the birds, the rolling of the waves and the place felt truly remote, the campsite at the top of the cliff invisible. To top it all, we had an unexpected encounter: not far from the beach, we saw a seal: brown, fat, whiskered, making the most of the morning. Seals are an unusual sight for me, used to warmer seas, and seeing it really made feel far away, in the best way possible. You really don’t need to travel far to get that sense of wonder! Please note: this review is unsolicited and unbiased and we received no compensation for it. We paid for our own stay and all opinions expressed are, as always, out own.